In a major setback to one of the India’s most successful agencies ISRO, its eighth satellite launch for the IRNSS series was unsuccessful. The reason of the failure was that the satellite’s protective heat shield, which is expected to separate and drop off, failed to do so, as said by AS Kiran, AS Kiran Kumar, the chief of space agency ISRO. “Today the launch mission has not succeeded. While all the systems of the launch vehicle performed extremely well, we had a mishap. The heat shield has not separated,” said the chief of the Indian Space Research Organisation (ISRO), shortly after the satellite failed to separate as scheduled about 20 minutes after the lift-off. 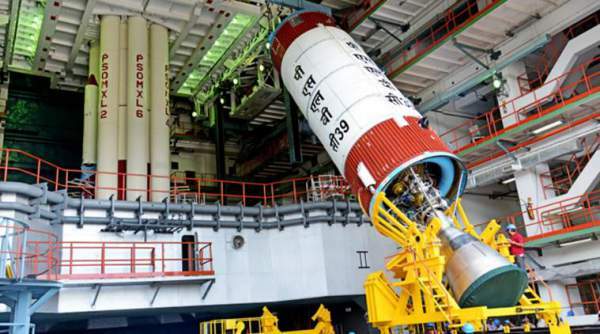 PSLV-C39 blasted off from the second launch pad at the Satish Dhawan Space Centre, Sriharikota at 7 pm with the IRNSS-1H present in its fourth stage. The heat shield works as a protective measure as it avoids the inner components from burning due to the intense heat generated because of the high amount of friction with the atmosphere at such high speeds. The covering is supposed to give away as soon as the satellite reaches the orbit. That is exactly what did not happen today. IRNSS-1H was supposed to the backup satellite for the first satellite in the constellation, IRNSS-1A, launched back in 2014, whose onboard clocks had started malfunctioning. The first atomic clock of the trio stopped working in the middle of the last year to be followed by failure of the rest two in coming six months. Such clocks are a crucial part of the navigation system. IRNSS stands for Indian Regional Navigation Satellite System, which is supposed to be the replacement of prime navigation system of GPS. The whole project was recently rechristened as NAVIC by Honnable PM Narendra Modi. As of now, only five nations boast of the capability to have an indigenous navigation system – Japan, China, US, Russia and the European Union. The original GPS is owned by the US Air Force and Russia calls its system as GLONASS. The constellation is already in orbit and system is expected to be operational from early 2018. NAVIC will provide two levels of service, the ‘standard positioning service’ will be open for civilian use, and a ‘restricted service’ (an encrypted one) for authorized users (including military). Apparently, this was for the first time that private sector was involved in a satellite launch by ISRO. The satellite IRNSS-1H was built by a consortium led by Alpha Design Technologies. This is a private company based in Bangalore and the development tool almost eight months. According to company sources, Colonel HS Shankar was supervising the project with a team seventy scientists working with him. As of now, a statement by the Alpha Designs is awaited. Here it is to be noted that the same company is also undertaking the development of another satellite for the ISRO. So, now after this failure, one may assume that the fate of the upcoming one hangs.